Can everyone please recommend a larger tire size for my Discovery 5? It currently has 255/55R20 and I would like to get bigger AT tires but I cannot add a lift. Any recommendations on tires would be a bonus. Last edited by SafariDave; 08-18-2017 at 01:10 PM. BFG All-Terrain T/A KO2 - these don't last all that long on heavy vehicles, but they're great off-road and they're three-peak mountain/snowflake rated, and they're supposedly not terrible all-seasons. Nokian Rotiiva AT - new tire, but Nokian makes excellent winter tires. Yes, I do take it off-road. SafariDave, are you meaning to say WITHOUT a lift that the maximum size would be 285/55/20? Do you have experience or knowledge that this is accurate or are you making any assumptions? Thank you. I never said without a lift. OP was for largest tire without a lift. I’m sorry but I don’t understand why some of you says that to go 285/50R20 a lift is needed, from factory you can go 285/40R22 that has the same dimensions. Do you have the Capability Package (i.e., with air suspension)? If so, the lowered setting might not have sufficient clearance for larger tires. 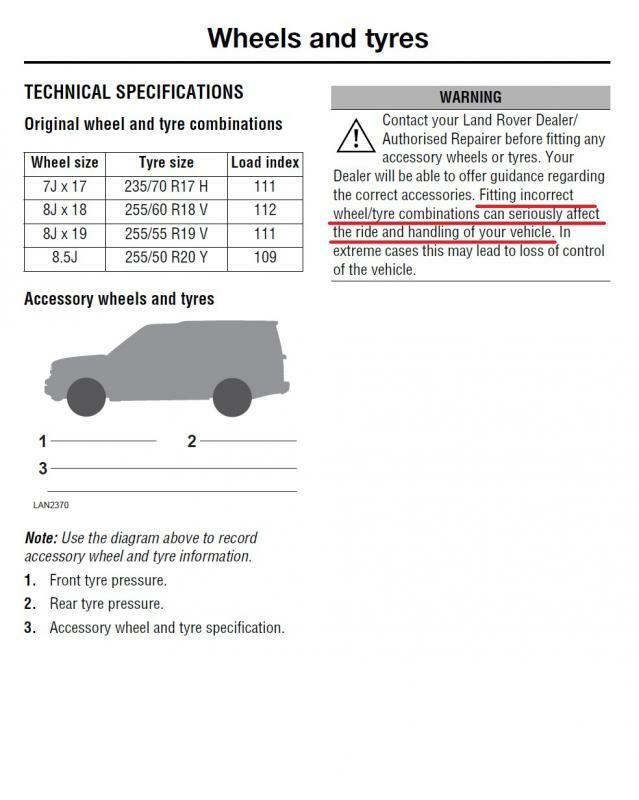 If that were true then there would be appropriate warnings in the Land Rover owners manual, and Land Rover dealers in America wouldn't be routinely performing suspension lifts and installing larger tyres. Is it possible that Land Rover computers can be reprogrammed to accommodate vehicle configuration changes, as is the case with other vehicles sold here? If that were true then there would be appropriate warnings in the Land Rover owners manual, and Land Rover dealers in America wouldn't be routinely performing suspension lifts and installing larger tyres. Last edited by sierrafery; 02-05-2018 at 09:28 AM. The new Discovery with the capability package is more off-road capable than any other land Rover or Range Rover sold in America, but the stock tires are not optimum for off road excursions. The increased capability that comes with more off-road suitable tires is worth the small sacrifice in fuel economy. The other adverse effects you cite are so insignificant as to not even be noticeable. If I'd wanted an everyday SUV for on-road use only, I could have gotten one for less than half the price of the Discovery. Someone better warn Land Rover the Discovery 5 SVX is coming from the factory with nearly 32" tires.